Can Frome become UK’s first fossil fuel free town? 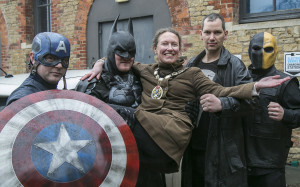 Mayor Kate Bielby by the electric car charging point at the Cheese and Grain -calling for help for a fossil fuel-free future from superheroes: Tom Castle as Captain America; Alan Shearing, Batman; Angel Sunley, The Punisher; and Anthony Down,Deathstroke, who were at a convention at the Cheese and Grain at the weekend. THE town council has announced ambitious plans to turn Frome into the UK’s first fossil fuel-free town. The council is looking at ways to reduce fossil fuels with the plan for the town to become completely fossil free within 30 years. The proposal, which outlines which key actions the town must take to achieve its green goal, will be heard at a council meeting this week. And already a programme of events on renewable energy and sustainability have been planned. Leader of the council Peter Macfadyen said, “Generating the power we need to live, work and travel without producing greenhouse gas pollution is a huge challenge but it is one every village, town and city will need to address. Starting next week, there will be a number of talks, a workshop and seminar on the subject. The energy-themed month kicks off on Thursday 3rd March with Sustainable Frome’s ‘Zero Carbon’ workshop at Oakfield Academy, looking at ways the community can cut emissions and support clean energy. The weekend will then be split into two events which will see delegates and visitors from Frome’s twin towns in France, Germany and Poland, take part and hear experts speak on the future of renewable technology. There will be a seminar on Friday 4th March from 1.45pm to 4.30pm at Rook Lane Arts focussing on how finance, policy, and planning can help support renewable initiatives. A conference on Saturday 5th will then be run from 9.30am to 4pm at the Cheese and Grain and explore cutting carbon from buildings, producing renewable energy, and creating renewable towns. Speakers will include Camille Dressler from the Isle of Eigg, which reclaimed its power as a community and produces all of its energy renewably; Professor Keith Barnham, author of the Solar Revolution; Professor Axel Goodbody from the University of Bath; and Jan Willem from Mongoose Energy. Other topics to be discussed will include local hydro power, community energy and biogas. A range of stalls and a vegetarian lunch will also be on offer. Frome residents are entitled to a 40% discount on the full price of £15 (£10 concessions), and should use the code SWITCHFrome when booking online. Tickets for the Rook Lane event cost £10 (£6 concessions). The following week, on Wednesday 9th March the film ‘Groundswell Rising’, about the effects of fracking in the USA, is to be shown from 7.30pm (doors open at 7pm) at Rook Lane and will include a talk by the producer and discussion with Frack Free Somerset.